Woodworking is one of the best hobbies that you can start either from your home workshop or locally in your town and make good money from your woodworking skills. Wood has been used for ages to make beautiful crafts and continues to be in demand to add beauty and function to our homes and offices. A woodworking business is a good venture and there is a lot of demand for wood products. America’s wood product manufacturing business generates over $6 billion annually and is forecasted to grow steadily. There are great opportunities for small businesses to capture market share because only 30% of the business is done by the largest firms. If you want to start a woodworking business, then this guide will help you to get started. If you are a detail-oriented person who is good at math and can handle just about any skill with your hands, then you are a good fit for woodworking. These skills will be essential when it comes to carving and making manufacturing wood products. A woodworker spends most of his or her day making wood crafts and other wood related products. This work involves designing, cutting, and sanding the wood, then assembling the wood into final products, and painting, as well as staining and furnishing the product ready for consumer purchasing. When a professional woodworker is not creating wood products, they are busy sourcing raw materials and marketing their products to customers. The ideal customer for a woodworking business is a person who loves and appreciates any wooden item and has enough money to afford wood products. Depending upon your designs this could be; expectant parents shopping for wood cribs, local building contractors needing specialized cabinets, retail stores who want custom signs and even online customers who appreciate wood creations. Decide your particular woodworking niche from wood product manufacture to a custom furniture maker. A woodworking business makes money by selling the wood products they design and manufacture at a price above the cost of materials and labor production. Popular wood products included house furniture, jewelry boxes, cutting boards, clocks, decorative signs, children’s toys, pens, office accessories, designer buttons, or beer mugs. Dependent upon your zoning laws, a woodworking business is the type of small business that can be run from home garage workshop, serving customers locally, selling products online, or it can be a large enterprise that serves customers across the country. Business growth can be dramatic such as Pittsburgh based furniture and cabinet maker, National Woodwork, which started 40 years ago. Making products from wood experience and crafting skills to produce products consistently without errors, since every scraped project is a business loss. It’s not difficult to acquire these skills but it does take a considerable amount of time and dedication to capture most of the details that go into making wood products. There are several organizations that will train you in making wood products and give you certifications but they are not necessary. If you want to make it in the woodwork industry, you are better off learning on the job. You can start learning and gaining your initial skills as a hobby but you will later have to be employed in a woodwork business in order to learn the essential skills and how to use the necessary machines. Here’s good advice on how to become a woodworker. The cost of starting a woodworking business can be a bit high but is manageable. As a business owner, you should have about $7,000. Listed below is a breakdown of how the money would be spent. This budget assumes that you have a workshop space that you can use to start your woodworking business. If you do not have enough space to start woodworking from your home, you will need to find a good place to rent with good security (to protect your valuable tools) to start and run your business. The good thing about having your own space to work from is that you reduce the renting expenses and you don’t need to find a workspace to lease. You can use your website to showcase your products and also sell your products online using e-commerce software. You can also look for fairs and festivals where you can be a vendor and sell your products. If you do not have enough money to purchase a particular tool that you need for your business. Try asking a friend to borrow his, convince them by offering to make them some wooden products they would like. Before you can start any woodworking business, it’s good to know all about the legal requirements that are needed to open and run a woodworking business. Ensure that you obtain all the necessary permits and licenses to avoid future conflicts with the law. Be sure to set up a business entity such as LLC – limited liability company or Corporation to protect your families assets. 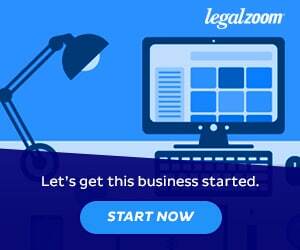 Save 10% with this LegalZoom promo code BEST4B19. It is also important you get an insurance cover for your business to cover anything that may come up – most importantly workman’s comp to cover any injuries. If you are already a professional woodworker who wants to establish a woodworking business and hire employees, its required by law to get a compensation insurance. Besides using social media, you can also place ads on advertising platforms such as Craigslist and online forums that are interested in your type of wood products. An example would be if you produce wooden rolling pins to post ads on baking and cooking forums. Another way to promote your woodworking services is to use flyers or business card distribution in your local area to get new customers. Keep in mind that in the woodworking industry, what sells your business best is your professional portfolio of completed projects. Get good pictures of your work and upload them to your website. Ensure that you add pictures in all of your flyers and business cards. These pictures should be visually enticing to get people inquiring about your services. Learn how you can make a living selling your woodwork online from successful woodworkers. In order to price your product strategically, here are the factors you need to consider. You should calculate, the cost of materials, labor, profit goals, overhead and marketing expenses. You can calculate using spreadsheets or manually with a calculator. Ensure that you set your yearly target and divide it by the number of hours you are willing to work in a year so as to get your hourly rate. Your hourly rate will be your labor cost. You can now go ahead and plan your woodworking business. This guide has all the basics you need to get started. Woodworking business is one of the best ways to make money while you enjoy what you love doing – creating with wood. Do not let the competition out there hold you back. Go for it and let your creativity and passion to succeed guide you in your new woodworking business.